No matter what you are doing today, or who you are spending it with then have a great day! To all the gamers who are in relationships, or those who just want to hear some great music you must check out the ‘2-Player Co-op song below. All credit goes to Danny Wiessner for this. This song features so many references to all different games it is incredible. Also, check out these very special Splinter Cell hearts as posted on the Splinter Cell Google+ page. If however you do not like valentines day then be sure to check out our other posts, have a video games marathon and visit this page again later for a un-valentines day post. Remember only 7 days to go until Sony’s ‘See the Future’ announcement! A few weeks ago, on 15th January 2013, Disney Infinity was announced to the world during an exclusive media event at the El Capitan Theatre in Hollywood. Set to be a new video game where a spark of imagination unlocks the freedom to play with some of your favorite Disney and Disney/Pixar characters. This game wants to take us to infinity and beyond (pun definitely intended) so lets go and explore what this game is about. Have you ever dreamed about writing your own story and having your favourite Disney/Pixar characters join together and star in it? This game can make that dream a reality. Disney Infinity, a third person adventuring mode, sees you accessing characters and environments by standing a series of chunky toys in different slots on the Infinity Base, this base is essential to the game as it allows the characters you have chosen to appear on screen before you. With the characters you have chosen you can choose to either play in worlds native to the characters or make your own worlds. It’s creativity and playfulness combined. If you’ve dreamed of ever having different Disney characters meet and explore their own missions then with good old Disney magic, this is a dream come true. Personally for me what would be interesting to see is what characters it features and which ones they do not feature, for example can you have ‘The Beast’ from ‘Beauty and the Beast’ appear or have all the classic Disney characters unfortunately disappeared. To play this video game to it’s full potential you will have to purchase additional features, there are power discs, playset pieces and hexagonal skin and item discs as well. The playset pieces unlock themed levels, the power discs which add buffs and abilities to characters when stacked underneath them, and the hexagonal discs allow you to unlock vehicles, items, wallpapers and give you even more to use when creating your own levels. With each play set created to give you an estimated 15+ hours of game play this could be worth it. There will initially be 40 interactive pieces and 17 characters to collect, but additional pieces, sets, and characters will release over time. What you do in this game is up to you. You can do a mission summoning a range of ‘prank’ devices to install at specific spots in a level, for example – things like call boxes which produce fly swats that knock characters around the map, or manhole covers that spring them into the air. Although each individual sets is reserved only for the specific characters whose worlds they draw upon. There will be no pirates around the plazas of Monster University and no superheroes on the deck of the Black Pearl. Editing is all done without leaving the game world or switching to another mode which of course is a plus. You simply equip your character with a magic wand that lets them highlight and manipulate things. You can load in new texture packs and sky domes by stacking power disks onto the Infinity Base alongside your figurines. The entire process will feel pretty effortless which allows for smoother game play. Infinity has been set for a June release on Xbox 360, PlayStation 3, Wii, Wii U, 3DS, PC, and mobile devices. Although June does seem a while away right not we absolutly cannot wait for E3! For that reason we’ve decided this blog post will feature what we already know about this years E3 and will be regulary updated with the latest news. So you don’t miss out on this we will regularly post on our Google+ page when this post has been updated, be sure to check it out and please like this post. Here is a quick link to our Google+ page https://plus.google.com/u/0/103896170333263244118/posts Don’t worry if you are new to gaming, have never heard about E3 before, or currently do not know who will be at E3, all is explained and revealed below, just for you. 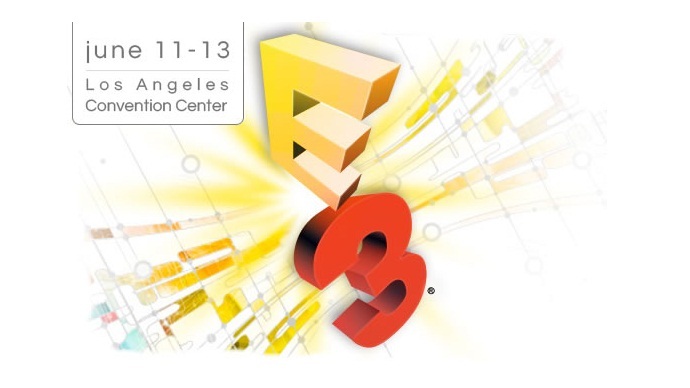 This year E3 is on 11th to 13 June at Los Angeles Convention Center, California. The show hours are; 12:00PM – 6:00PM on Tuesday 11th June 2013, 10:00AM – 6:00PM on Wednesday 12th June 2013 and 10:00AM – 5:00PM on Thursday 13th June 2013. Please note all times are Pacific Time Zone, UTC-8. This is the largest trade show and covers all aspects of gaming. You cannot rightfully be a true geek until you have either been lucky enough to attend or sat on your laptop at home watching live the latest streaming of E3 coverage. (Or so that is my definition) An Expo floor pass for all 3 days will set you back $795 ($995 after 29th April 2013), a Industry pass is free with the catch being you have to be a qualified Interactive Entertainment Industry, meaning professionals only. Entertainment Software Association (ESA) have announced they will continue to hold this event in Los Angeles until 2015. There is a possibility of Sony announcing the PS3 for the first time. This has been hinted at with the past with Sony being in no rush to make an announcement, with the GDC (Game Developers Conference) happing in March maybe Sony will wait until June. If you are a Nintendo fan then you’ll like this. Nintendo has confirmed that the next Super Smash Bros. game, which is to be a new 3D Mario game and a Mario Kart for Wii U will make their debut at E3. E3 (2013) Exhibitor Directory. [online] Available at: http://e313.mapyourshow.com/5_0/exhibitor_results.cfm?type=alpha&alpha=@&CFID=78168060&CFTOKEN=f5644dccd231e99-1963A875-E1AA-7D72-EA0FE36A9180FC2C [Accessed: 23 Jan 2013]. E3 (2013) Welcome to E3 2013 . [online] Available at: http://www.e3expo.com/homepage/ [Accessed: 23 Jan 2013]. GenGame (2013) Major Nelson is Particularly Excited About E3 2013 for Some Reason | GenGAME. [online] Available at: http://gengame.net/2013/01/major-nelson-is-particularly-excited-about-e3-2013-for-some-reason/ [Accessed: 23 Jan 2013]. IGN (2013) Smash Bros, Mario, Mario Kart Confirmed for E3 2013 – IGN. [online] Available at: http://uk.ign.com/articles/2013/01/23/smash-bros-mario-mario-kart-confirmed-for-e3-2013 [Accessed: 23 Jan 2013]. pwnrsmanual (2013) Dates for your geek calendar! (Part 1). [online] Available at: https://pwnersmanual.wordpress.com/2013/01/11/dates-for-your-geek-calendar/ [Accessed: 23 Jan 2013]. I love to be outside and find things that relate to the geek world. No, not like a game but something bigger. Although, don’t get me wrong, finding the game you’ve always wanted or the latest game is of course amazing! 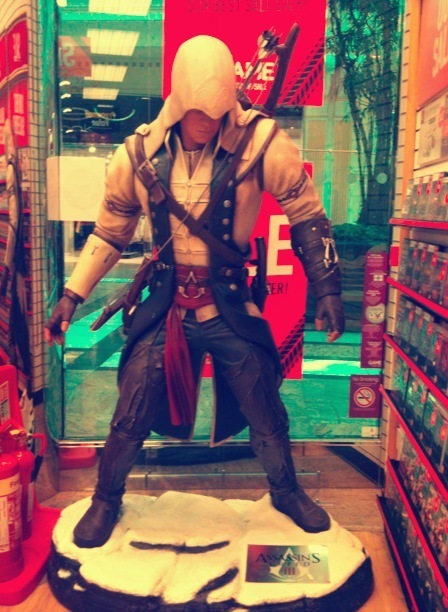 Today I discovered this, a life-size figure of Connor Kenway from Assassin’s Creed III, in The Trafford Centre, Manchester, England.